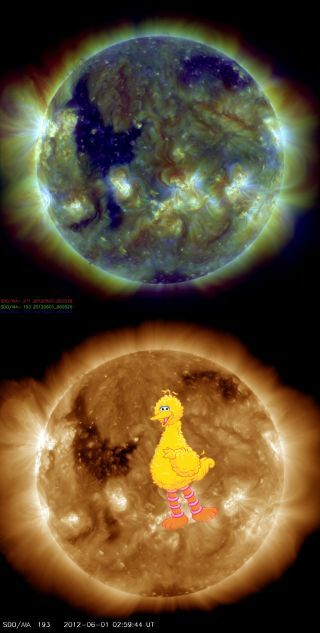 This photo from NASA's Solar Dynamics Observatory (SDO) spacecraft, snapped on June 1, 2012, shows a feature that looks like Big Bird on the surface of the sun (SDO staff added the picture of the "Sesame Street" character). The feature is actually a coronal hole, a dark region in the sun's upper atmosphere. A new photo from a NASA sun-watching spacecraft highlights a huge solar feature that looks a lot like the beloved Big Bird from the children's television show "Sesame Street." The image, snapped today (June 1) by NASA's Solar Dynamics Observatory (SDO) probe, actually shows a so-called coronal hole — an area where the sun's corona, or outer atmosphere, is dark. But the resemblance to Big Bird, or one of his feathered kin anyway, is uncanny. "I can't get over how much this looks like Big Bird — but it is a coronal hole on the sun," reads a Twitter post today by Camilla Corona SDO, the spacecraft's rubber chicken mascot. The rubber chicken's Twitter feed is part of NASA's social media outreach efforts. Officials pasted a picture of the "Sesame Street" character next to the 'Big Bird' coronal hole for comparison. The image of Big Bird on the sun is an example of pareidolia, which is the tendency of the human brain to recognize animals or other prominent shapes in vague or random images. This view of an elephant's head on Mars is another example. Coronal holes are associated with "open" magnetic field lines, which extend out into interplanetary space rather than arc back to the solar surface. Coronal holes are often found near the sun's poles, Camilla added, and the high-speed solar wind — a stream of charged particles flowing from the sun's upper atmosphere — is known to originate in them. The super-speedy solar wind from the 'Big Bird' coronal hole will reach Earth between June 5 and June 7, Camilla said. This photo from NASA's Solar Dynamics Observatory spacecraft, snapped on June 1, 2012, captures what looks like Big Bird on the surface of the sun. The feature is actually a coronal hole, a dark area of the sun's upper atmosphere. CMEs that hit Earth inject large amounts of energy into the planet's magnetic field, spawning potentially devastating geomagnetic storms that can disrupt GPS signals, radio communications and power grids for days, researchers say. These storms can also super-charge the northern and southern lights, generating brilliant shows for skywatchers at high latitudes. The $850 million SDO spacecraft launched in February 2010. The probe's five-year mission is the cornerstone of a NASA science program called Living with a Star, which aims to help researchers better understand aspects of the sun-Earth system that affect our lives and society.